Here is the latest satellite image of Hurricane Sandy. She is strengthening and moving northwest. 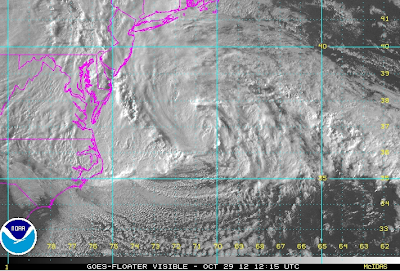 The pressure is 946 mb and has sustained winds of 85 mph. I expect Sandy to strengthen to 90-95 mph sustained winds with peak gusts to 100-110 mph. 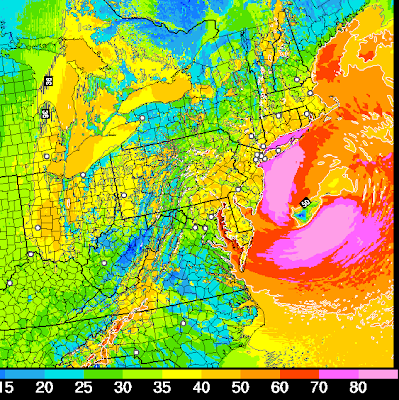 Winds on Long Island are now gusting to near 50 mph. They will only go up today. 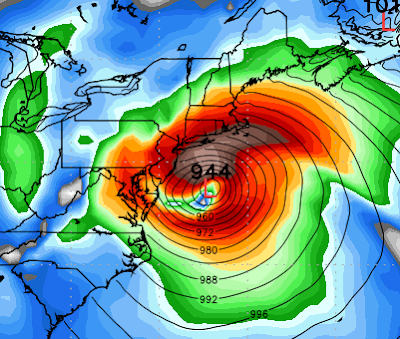 The pressure is forecast to drop another two millibars as it moves WNW toward the New Jersey coast. The scale is in knots. In order to get mph, you have to multiply by 1.15. So, 60 knots = 69 mph. 70 knots = 81 mph. 80 knots = 92 mph. The scale only goes up to 80 knots. 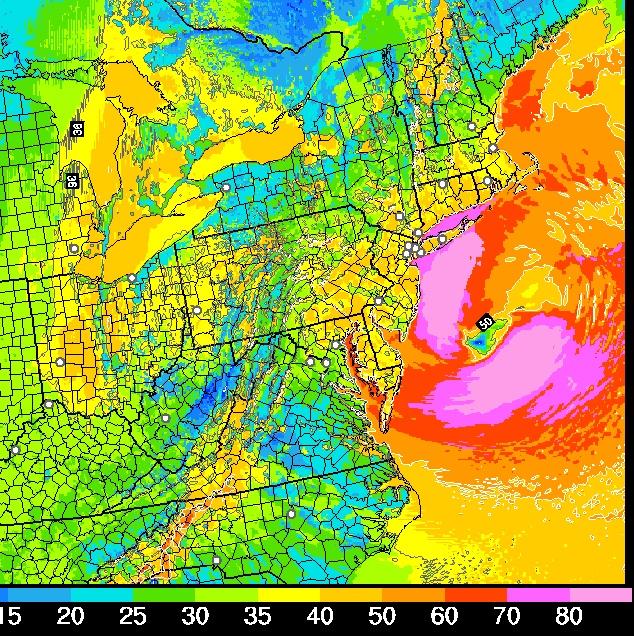 Note the extreme winds in Long Island Sound as well as the New Jersey coast. Note also the gusts above 60 mph near the NC-VA border in the mountains as well as the increasing winds (gusts to near 50 mph from the north) over the Great Lakes. Note the winds are very high in the Washington, DC area. Increasingly high winds are forecast on the Great Lakes. Orange equals blizzard warning, pink is a winter storm warning (something less than a 'blizzard' but still serious). 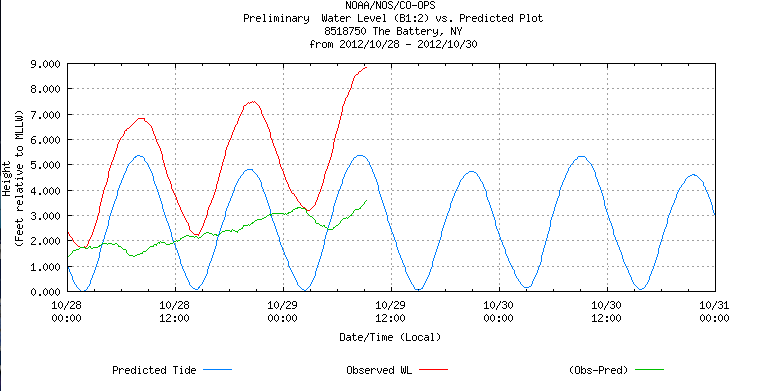 Here is the latest tide gauge at The Battery NY where water is lapping on the Promenade. Note that the peak, so far, is 9.0'. 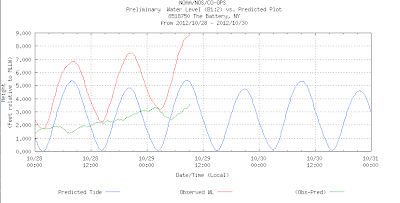 The surge will increase the water level at least another 2.5' if forecasts are correct. Please read through the postings below for more on storm surge. That is the latest on Hurricane Sandy. 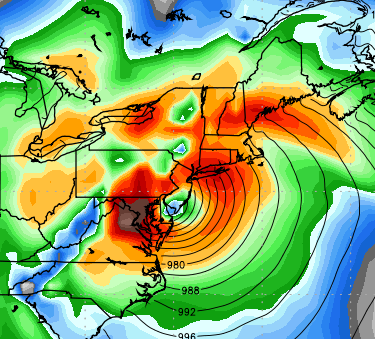 When looking at the 8 p.m. wind forecast, what speeds are the brown areas in the DC area? Gusts at least 70 mph late this evening and/or overnight. I live in the greater Philadelphia region and my mind literally rejected the first image. I couldn't figure out what I was looking at until this morning--I kept looking for Florida and when I didn't see it, I just moved on to the next. Thanks for this very informative blog. It was very helpful.